As the lava flow from Kīlauea threatens to hit the town of Pāhoa, the potential cutting off of memories is also a concern. As part of our ongoing series, HPR’s Molly Solomon takes a personal look at what that means to people who may never be able to go back. Craig Shimoda pulls up to meet me in his dusty blue station wagon. I hop in and we drive for about a mile from the main road. He’s taking me to see the Pāhoa Japanese cemetery. "A lot of people don't know this is here," says Shimoda. 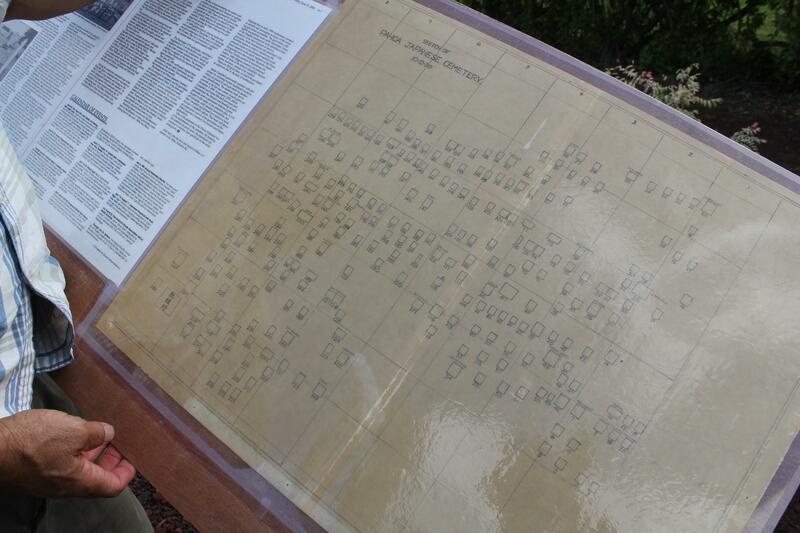 Craig Shimoda holds up a map of the graves at the cemetery. 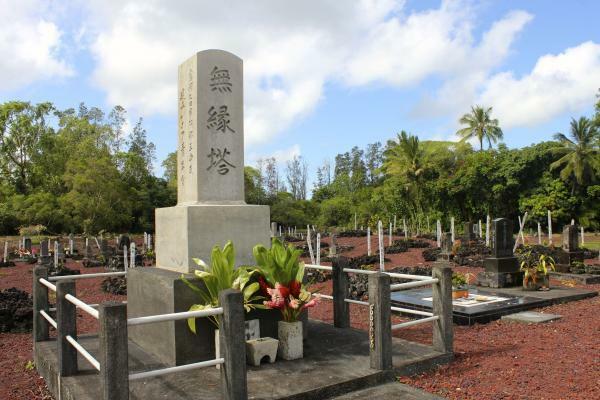 One of his duties as the President of the Pāhoa Nikkei Jin Kai, is to maintain the dozens of graves of Japanese Issei, first-generation immigrants who came to the rural town as plantation workers. One of them was my great-grandfather. But we’ll come back to that later. Craig and I turn onto a dirt road and drive past a metal gate. "It's beautiful out here," he says as he hops out of the car. "Whenever you come out here it's so peaceful." The cemetery is made up more than 250 graves, many of them marked as unknown. The tombstones that remain are worn, some dating back as early as 1905. Some families have already started to collect their tombstones, fearing the lava may destroy the cemetery. Craig says people have already started to collect tombstones, worrying the lava will take the graves. Others have come to say goodbye to their ancestors for what they fear may be the last time. 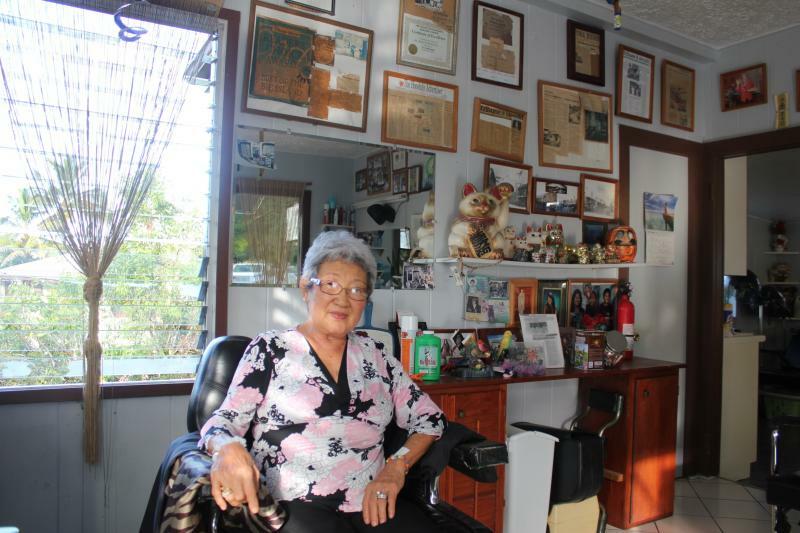 "I was born in Pāhoa in 1937 and I went to Pāhoa High School. 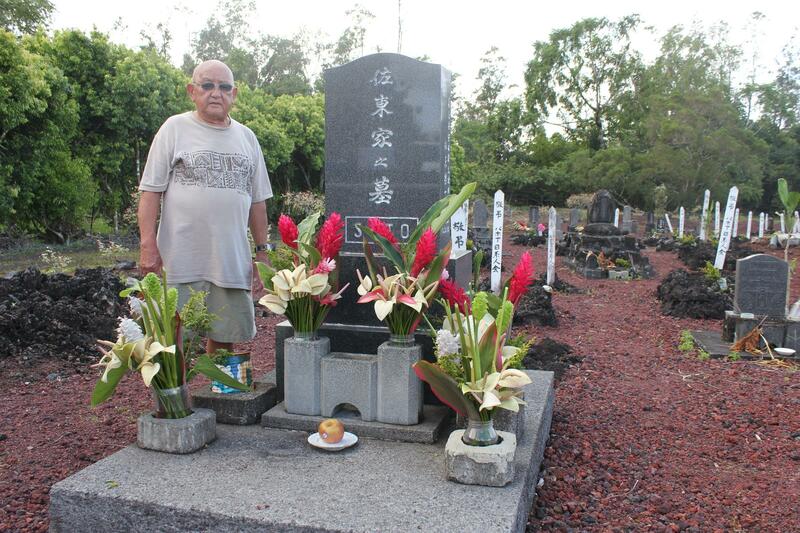 I've lived here all my life," says Roy Sato, who's come to visit his family grave. "My mom and dad, sister and brother are in this tombstone." Roy now lives in Kurtistown, the next town over. Prompted by the lava, he’s come back to Pāhoa to spend the day cleaning his family grave. He sits down to light incense and places a handful of bright red anthuriums in a vase. "That's why I'm here, to take a picture," Roy says as he places an apple before the altar. "Because once it's covered, it's gone forever"
Roy Sato was born and raised in Pahoa. 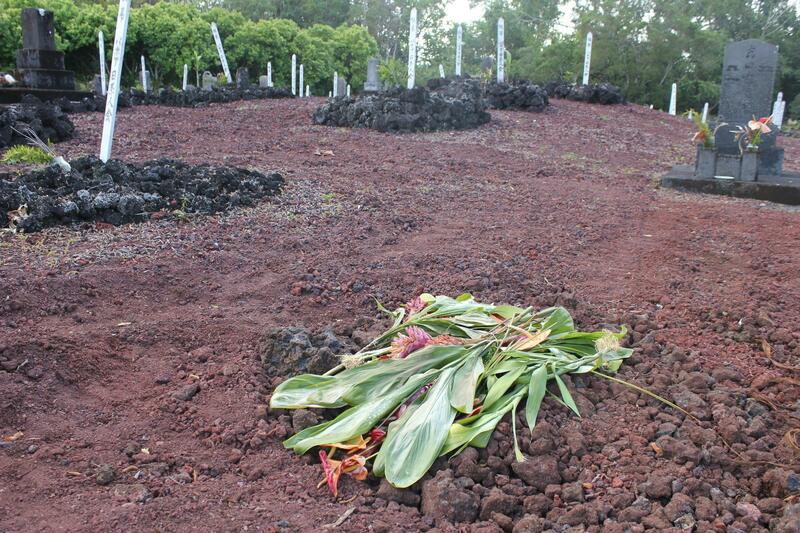 He came back to visit his family's tombstone when he heard about the lava flow. Roy’s also in town to see his sister and niece, who still live in Pāhoa. He plans to walk down the main road and visit some of his favorite spots, including the Akebono Theatre and his old elementary school. "What Pāhoa means to me is, you know, we were born here. To see it go under the lava is really sad. But can't fight mother nature, I guess." As we head back to his car, Craig pulls out two framed maps from his trunk, detailing the burial plots in the cemetery. The maps are intricately drawn by hand on old parchment paper, each grave is marked with a number that corresponds to a list of names. My aunt Edith and my mom, Annie, are along for the ride as we visit Pāhoa. That's because this town is also where my grandpa is from. They scan the map for a Kiyoshi Yoshiwa, his brother. "Yeah, there it is...Yoshiwa," Edith says pointing to plot 84 on the map. "My uncle." Kiyoshi was only a baby when he passed away -- his twin brother Uncle Johnny lived in Pāhoa most of his adult life. My aunt used to joke, at age 70—he was probably the oldest bagger at Pāhoa Cash & Carry. 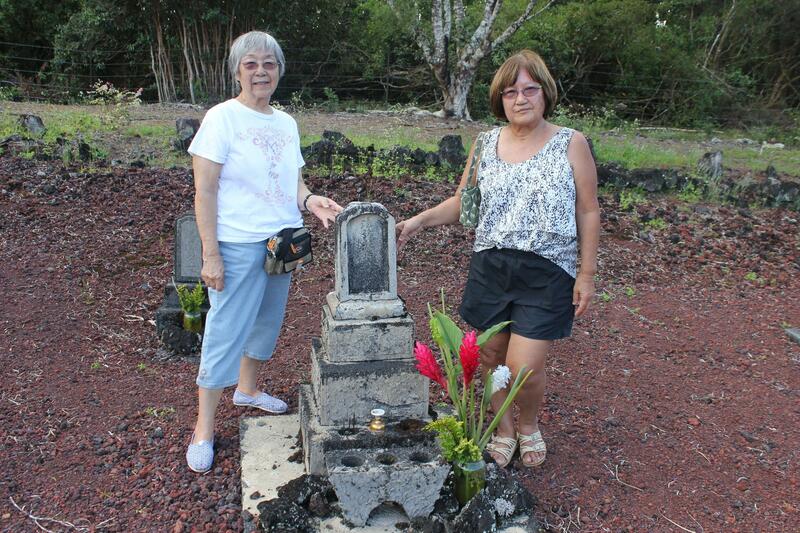 Edith Nakao, my aunt, and my mom Annie in front of the grave of my great-uncle Kiyoshi Yoshiwa. Our family roots in Pāhoa started with my great grandparents who moved to the Big Island from Hiroshima. Like many young people at the time, my grandfather Eichi Nakao, dropped out of school in the 6th grade to help raise money for the family…working in the sugar cane fields in Puna. Back in town, I walk through the main drag in Pāhoa with my mom. As we begin to talk story, it's clear: family memories are everywhere. 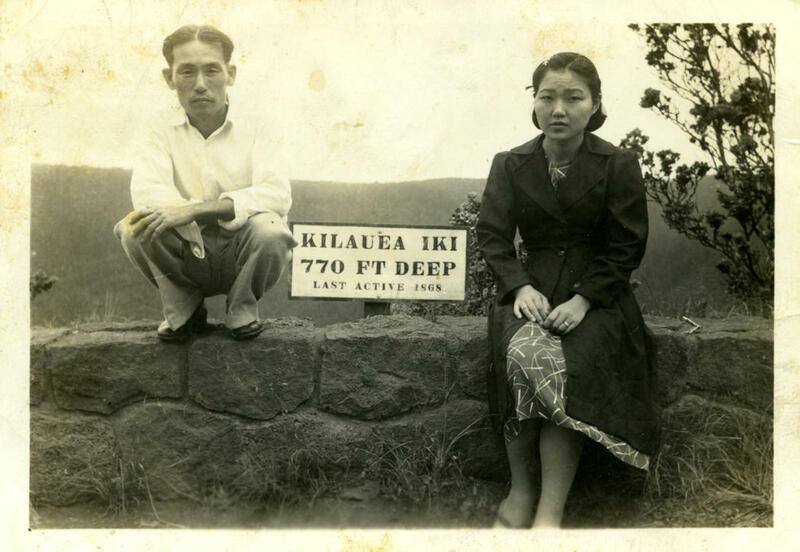 My grandpa Eichi Nakao and my grandma Yoshiko pose in front of Kilauea Volcano during their honeymoon on Hawaii Island in June, 1940. There’s the window Gramps used to sneak into at the Akebono Theatre. Or the time he and his friend got lost in an old lava tube and the whole village went to look for them. And while those memories linger, their physical reminders may not. "If that's wiped out, your family history is gone," my mom says as we walk past shops and restaurants, some already beginning to pack up in anticipation of the lava. "Your memories are wrapped up in these physical things. And when you don't have those, you kind of lose something." 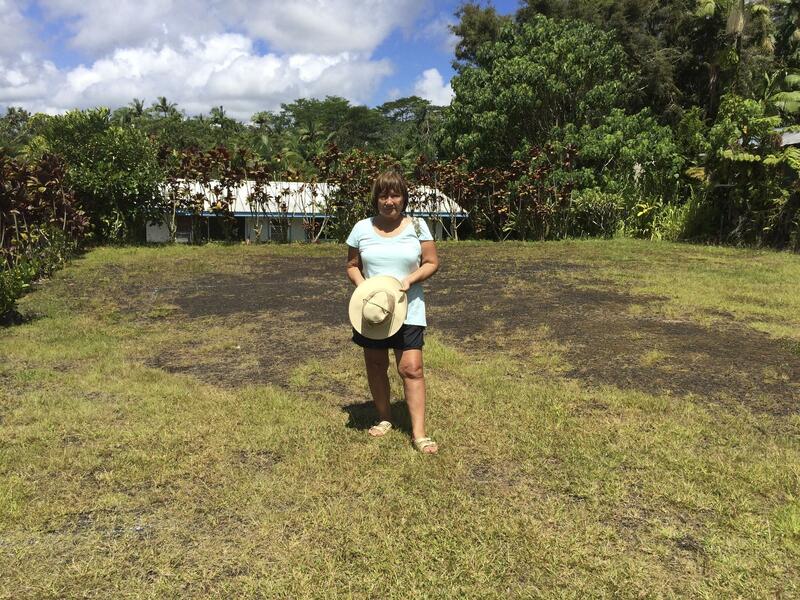 My mom, Annie, standing where the family home used to be. It's since been torn down. And that’s why this trip is personal. There’s a real purpose to coming back. "Because without those things, you lose that thread," she says. "And I think that's why people go back. They want to see those things, they want to touch those things. When that's gone, I think you really lose a lot — you lose your history." History that many, including my family, want to visit while it’s still there. Officials are saying lava heading towards Pāhoa on Hawaii's Big Island has slowed for now. But that isn't putting anyone at ease. Over the next few days, we’ll hear stories of how people are dealing with this uncertainty. HPR’s Molly Solomon spent some time in Pāhoa, and found a town with a colorful past and an uncertain future. 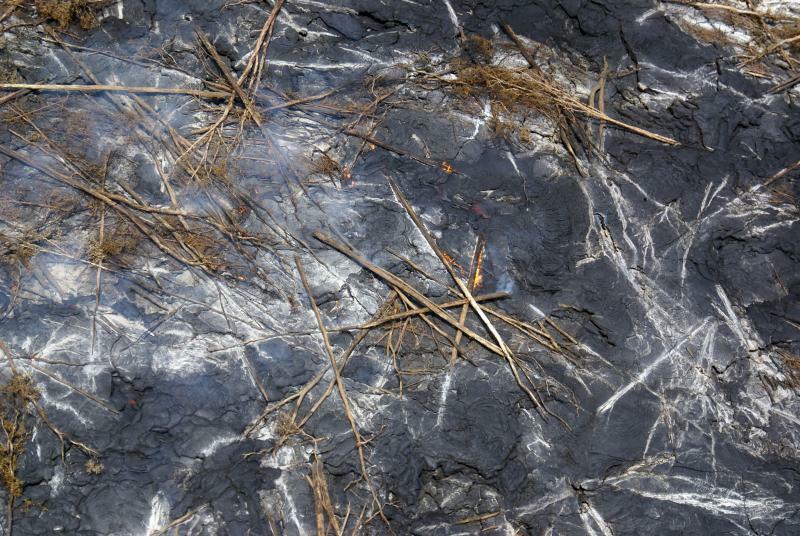 The town of Pāhoa on Hawaii's Big Island is making preparations to deal with the possibility of a lava flow. And while it’s stalled for now, officials are continuing to monitor the active flow, where a breakout continues to move. It’s a familiar story for residents in that area, many of whom have gone through this once before. HPR’s Molly Solomon reports. The lava flow from Kilauea Volcano's Pu'u 'O'o Vent is continuing its slow movement towards Pahoa and beyond. HPR's Sherry Bracken talked with the Mayor yesterday to get the latest update.